Art always wanted to start a Thread to track the owners of 1st Generation Ski Nautiques. So hear you go Art. We should let Alan be the first to post here as he is the owner of Ski Nautique Number 1. Had to chime in.. (also to get notices of posts :) 1st Gen Roster...Great idea! 1967 - Power Blue, split windshield, 318 Chrysler. In the midst of a slow going restoration of stringers, floor, all interior and gelcoat. Here is a picture from several years ago prior to going under the knife. On behalf of Correct Craft, registering the 1961 Ski Nautique that lives in the reception lobby at the factory. It goes to the Masters Waterski & Wakeboard Tournament at Callaway Gardens each year, leads the Opening Ceremony boat parade and bears the Flag for the National Anthem before the finals, I also frequently bring it to CCF events. Unfortunately, the hull ID number was lost when the boat was re-stringered in 1986. We know that it was one of the first few built by Correct Craft after acquiring the molds from Leo Bentz. It could have been the first one, but we can't claim that without evidence. It's a white hull with red deck, as were most of the boats that we built for Cypress Gardens. The engine is either a 292 or a 312 Interceptor, we don't know for sure which it is. The engine is either a 292 or a 312 Interceptor, we don't know for sure which it is. Has the engine ever been rebuilt? If not, I'd say it's the 292 or even a 272? If you get a chance, look for the engine model number which will confirm the CI. It will be on the cam shaft cover where the mechanical tach output drive is located. BTW, does it have a mechanical or electric tach? There's two first Gen on my lake. #1 which is my uncles. He is technically 3rd owner but I say 2nd because my family was the 2nd but we never did anything to it. We know the whole history of it and it's been either in family, or very close to family it's whole life. 1969 Ski Nautique originally had a 318, but now has a 440 (sorry pete, I tried to tell him keep it original) Red hull with ivory deck. #2 Some guy on our lake has a 1966-1969 (don't know exact year) Sea foam green that seems all original. His dad was the original owner and it was passed on to him. I've been trying to talk my dad into buying it and restoring it. And this lake is called? Lake of the Woods. It's between Bremen Indiana and Plymouth Indiana. Pete, the original front engine cover, which is where Eaton stamped the engine data, long ago went to Corrosion Heaven and was replaced with a service part. Those covers are known for corroding through at the 90-degree turn where the water enters the block. And when they corrode through, the water goes directly into the oil. I don't remember enough about the rebuild to be sure, but I know that we replaced the block. Whether it was an empty block or a short block, I don'[t remember. 292s and 312s were machined from the same castings, so the casting numbers only mean that it is one or the other. The cranks are different, and one way to tell without going inside the engine is to look on the flywheel flange on the crank. A 312 crank will have a round indentation about 5/16" in diameter on the flange. And I'm not about to pull off the trannie, bellhousing, and flywheel to find out! I'm sure there are lots of people out there who would like to have it. I'm always opposed to parting them out.
. BTW, does it have a mechanical or electric tach? The engine has the connection on the cover for a mechanical tach, but there is an electric tach in the boat. I don't think there ever has been a Ski Nautique built by CC that had a mechanical tach in it. I think the Graymarines were the last engines we set with mechanical tachs. Looks like a center deck boat. Do you know the hull number? I am with Art, don't part it out. How are the stringers? I think the Graymarines were the last engines we set with mechanical tachs. And the Hercules tagged as Correct Craft engines but marinized by Chris. Adding my '67 to the list, will have to check the hull number. Originally had a LA/LM 318 and a wood motorbox. TBD what goes back in it... This boat is on my long term list. calender shot Steve...nice shot of Alan's/Gene's beautiful '81 in the background. Never made it, got lost on the cutting room floor. MY pictures are not MoreFoot or Frankenotter quality. 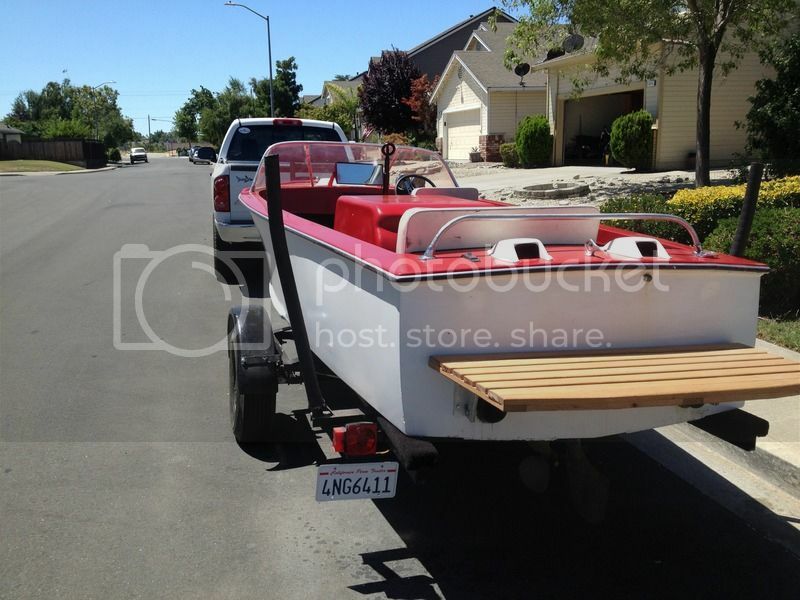 Hi Guys just brought another project boat been told its a nautique can anyone give some info ? 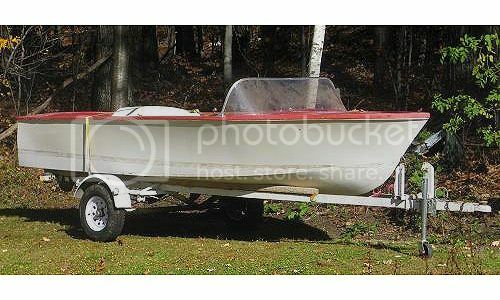 It looks like a 1970;s Ski Nautique, but I can't tell for sure. Is the dashboard area inside the windshield gelcoated in black? The wing vents in the windshield date the windshield, but I don't recall the year that they were put in. If it's a 1972 or earlier, there should be an aluminum plate in front of the throttle control with a model and number stamped into it, like SN 0000. If it's '73 or later, there will be a number engraved in the upper starboard side of the transom that begins with CTC followed by nine more characters. The engine definitely doesn't look original. Definitely a 1st gen SN but it's been highly, umm, modified. I don't see much original hardware left on it. Doesn't look to be a period correct Chrysler marinization, I'm guessing that's not original either. I haven't been able to decide whether I'm seeing wood spray rails on the forward chines, or if I'm seeing shadows in the photos. Wooden rails mean 1969 or earlier. Also can't tell whether the "rail" that ran around the perimeter of the foredeck on the Gen Ones is there or not. In the third photo (the one with the price still written on the w/s) it looks as though it's there, but the other photos, no. Forest, how about some photos of the items we have mentioned when you have time. The interior, the foredeck, chines forward, etc. The engine and the pylon are definitely not original equipment, but nothing negative about that. Looking at the pictures, it looks like a 1969 of prior Ski Nautique. I, like Art, would like to see a picture of the foredeck to be sure. The windshield is not correct, and there are things missing, like the front and rear left rings for the boat. 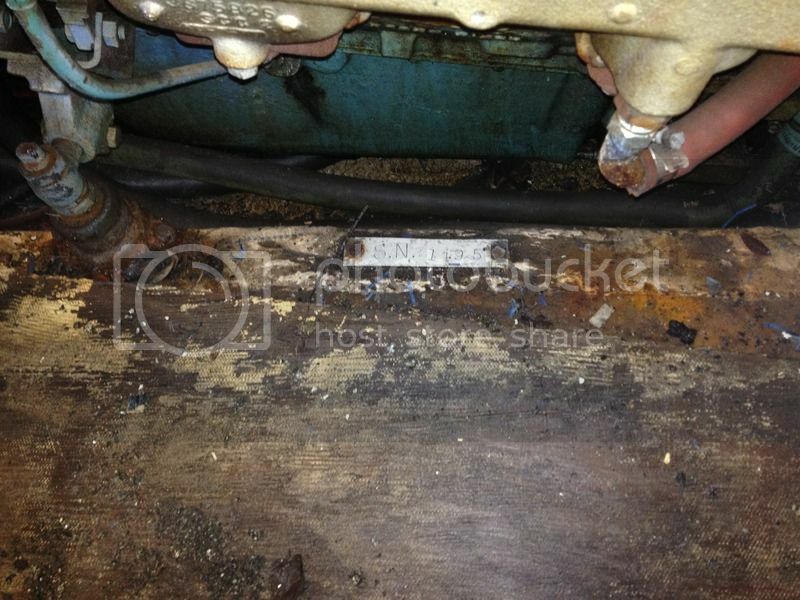 If there is a hull ID number still attached it would be in the engine compartment, SN####. Looks like a project. 1967 with a 318 Chrysler and a few mods.